Mr Devlin is our PE teacher and PE Lead. He works alongside other teachers to provide comprehensive curriculum coverage but also a wider offer of sports participation. He is responsible for monitoring the spending of our PE Premium funding. Our school achieved the School Games Mark Silver Award during 2017/18 for our PE and sport provision as well as Modeshift Star Bronze award for increased physical activity in how we travel to school. . This year we are aiming to achieve the Gold Award. Have a look at the criteria below to see what the kite mark entails. You can view PE and Sports activities by following the PE section of our 'Curriculum in Action' page. Our under-9 footballers are Newcastle Schools' Cup winners. We entered four teams to compete against 800 other runners in the Newcastle Croos Country Championships. 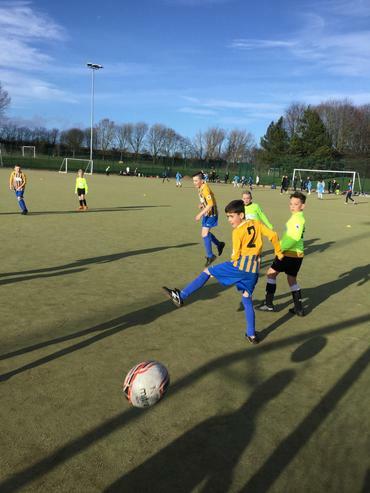 Our football team play in the Duffy League and finished in mid table this season. We were runners-up in the OWL Trust Premier Sports Basketball tournament. We are attempting to increase our activity by taking part in the Golden Mile in Year 4. We took part in the Newcastle School Games Athletic Championships against 550 other athletes from across our city. It took place over 3 days and involved running and field events. Our KS1 gymnasts were victorious in the OWL Premier Sport competition. Our season has kicked off with our OWL Trust Dodgeball Tournaments. KS1 and KS2 participated in an O.W.L Sports Day competition. The KS1 team won their overall team event, with one team member receiving an award for being the most valuable player. 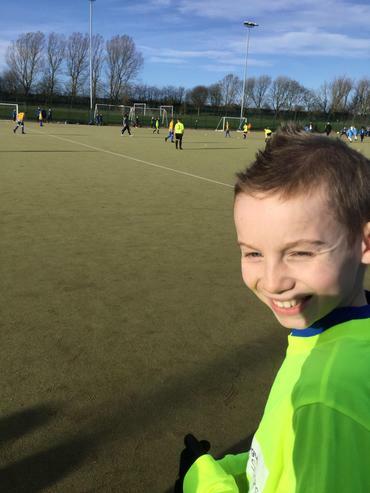 Pupils from Westerhope have been enjoying learning a new sport during an after-school Gaelic club. 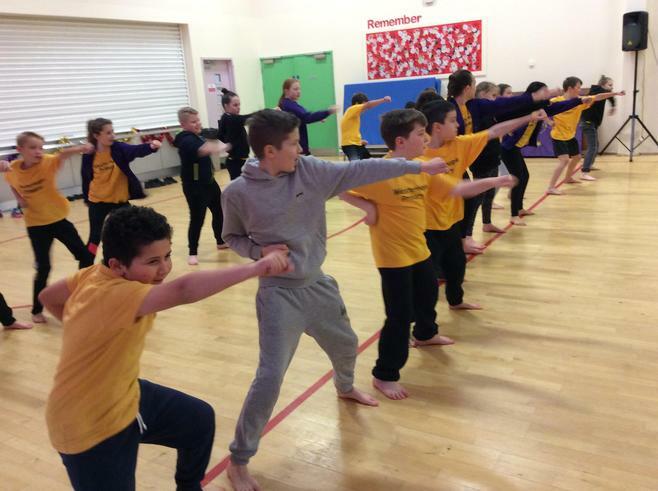 They have been developing skills such as, High Catch, Crouch Lift, Toe Tap/ Solo and Fist Pass. Year 4 and 6 worked alongside a member from the British Cycling organisation to develop their racing skills. The experience encouraged children to consider taking up cycling as a sport. 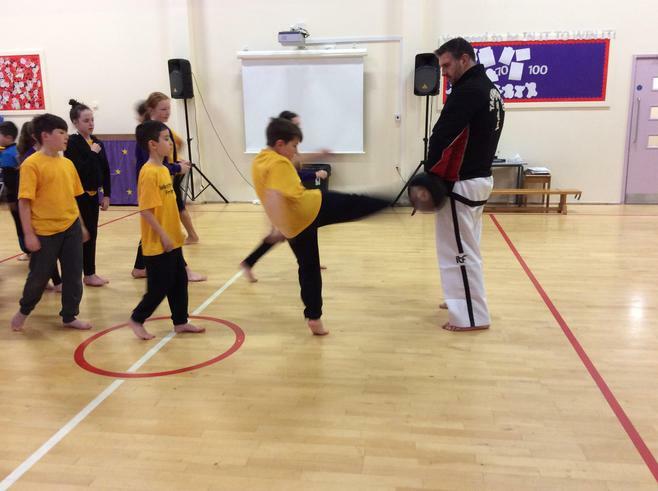 We invited a Tae kwon do black belt expert in to deliver sessions to Year 2 and 3. These sessions have helped to make links with local clubs and introduce children to alternative sports. Below are some further examples of how our pupils benefit from PE and Sport Premium. We use PE Premium funding to promote new sports. This team took part in the Premier Sports Curling Championship recently. 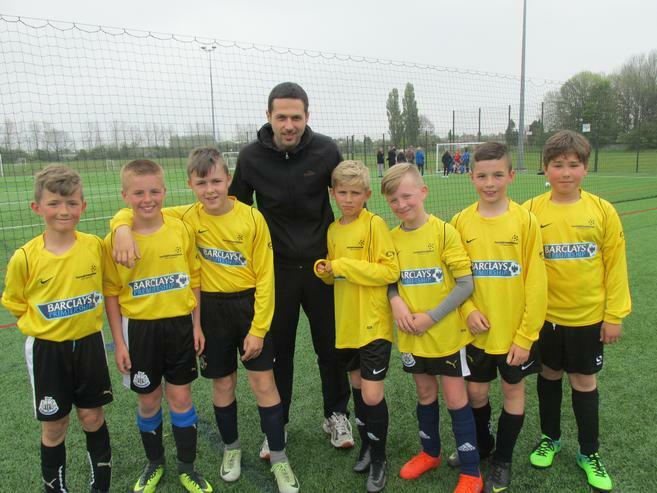 PE Premium contributes to the Premier Sport OWL Trust League. This was our lower KS2 football team. 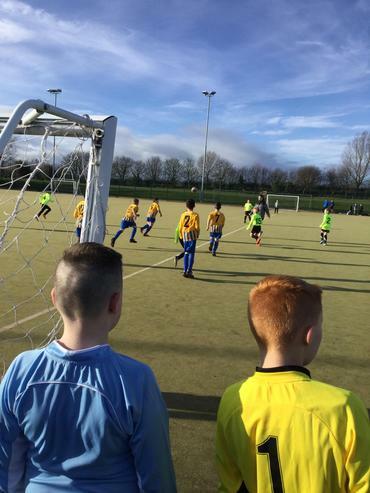 PE Premium allows us to travel to some excellent venues to play against other schools. Our year 4 tennis team played at the Newcastle Badminton Centre recently. Our pupils travelled to Blakelaw with hundreds of other runners for the Newcastle Cross Country Championships. A number of KS2 children have been participating in training to become Sports Leaders. After the Easter Holidays, they will be a constant presence on the yard to promote active lunch times. A group of KS1 children demonstrated brilliant levels of agility, hand- eye co-ordination and team work during the recent Premier Sport's Dodgeball competition. Pupil Premium allows us to send pupils to competitions with other schools. This pupil achieved a place at the City Swimming Gala recently as part of Mr Devlin's squadron. 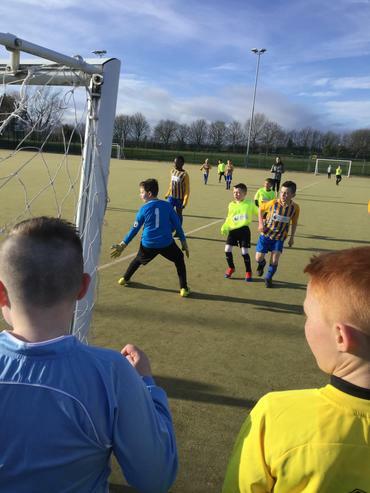 We have taken part in 16 separate inter-school competitions from September to end March. 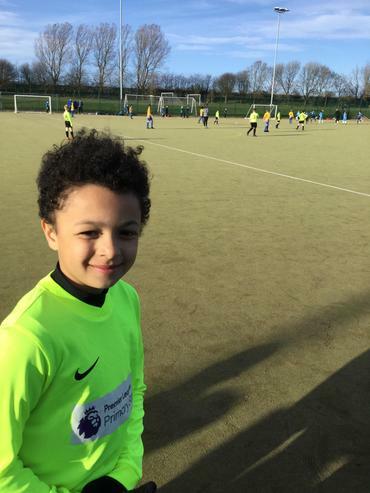 All of our Outer West Learning Trust schools compete in the Premier Sports League. Each event has a different sporting focus and age group. The team below were selected by Mr Devlin for their movement performance during PE sessions to represent the school in the fencing competition. Pupil Premium funding allows us to travel to venues around the city. Our lower KS2 hockey team played against eighteen other schools as part of the Newcastle Sports Partnership. Mr Devlin is our PE teacher. He prepares our pupils for competitive tournaments against other schools. This team won the Outer West Trust competition recently. The focus was multi-skills to develop speed, agility and ball skills. We entered the Newcastle Games events this year in order to increase inter-school activity. 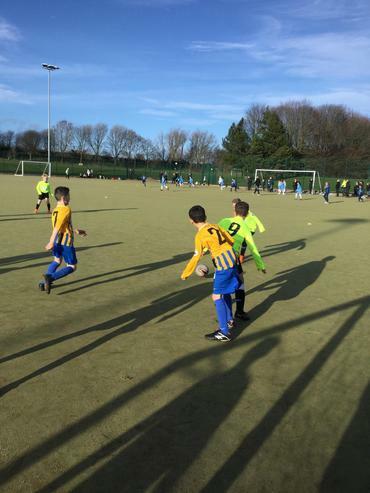 Here we see Mr Devlin's hockey team in action at the Jesmond tournament. We demonstrated a high level of skills that have been coached in PE lessons and in clubs. We take part in the OWL Trust Premier Sports League. We won the latest basketball final recently. The Newcastle School Games partnership is a way of competing against other schools. We played in the recent netball tournament at the Walker Dome. 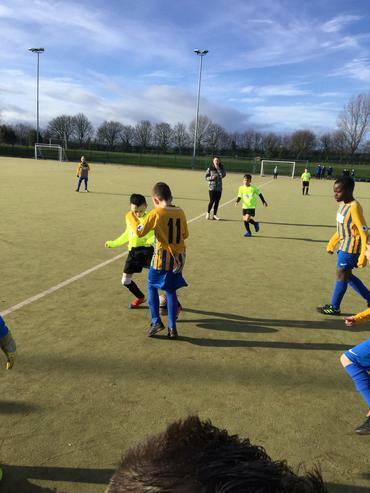 We utilise expert coaches to introduce new sports and coach our pupils. Mr Hall is working with Mr Devlin to coach badminton. 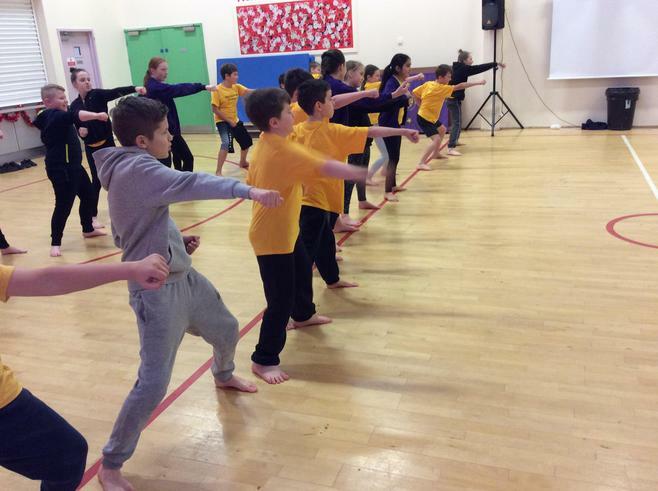 Year 6 thoroughly enjoyed a lesson from a world renowned Tae Kwon Do professional. 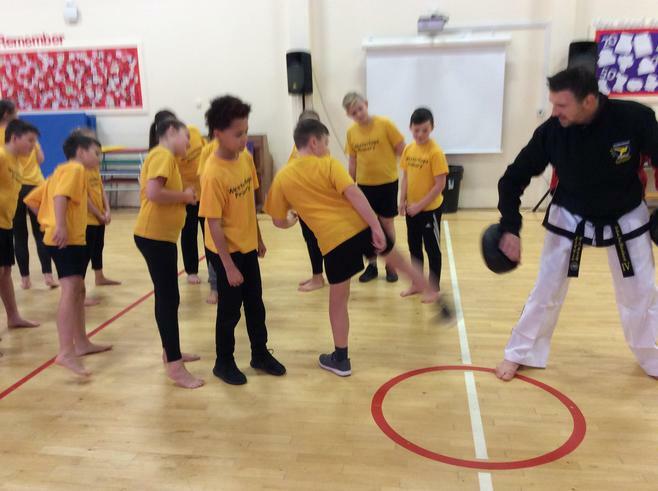 They had the opportunity to learn about discipline in Martial Arts and practise their striking, kicking and defending abilities in a respectful and controlled manner. We enter inter-school competitions. PE Premium funding helps to support these opportunities. This is our netball team training for a competition with other schools. On Wednesday, Year 5 and 6 participated in an intra-school athletic competition which involved both track and field events. Mr Devlin is our PE teacher. He goes on courses and works with other teachers to make sure we have lots of opportunities to compete with other schools and so that we he is always improving our PE offer alongside Mr McDonald our PE Lead. He keeps adding to our PE curriculum and keeps records of how each child is working. We have lots of new equipment for games, gymnastics, dance, athletics and for outdoor adventure we have new tents. We have outdoor adventure opportunities in the urban environment with Mr Brown. We have coaches such as Leanne from Northern Dance Stars coming to teach us. We have special sporting weeks such as Sports Week to increase the activity of our pupils at key times. We have increased our participation in competitive school events. 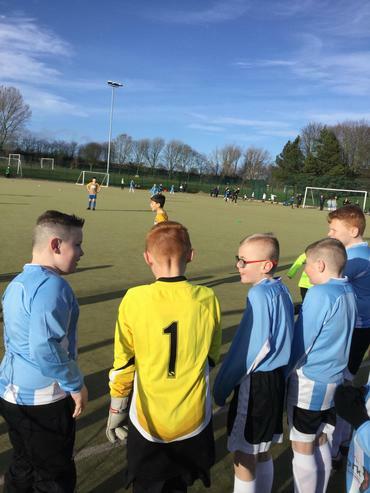 Our football team are the second best team in Newcastle after winning the Duffy League and then narrowly losing the King Cup final recently. We take part in Outer West Learning Trust competitors alongside other schools. PE Premium funding is utilised to support these events. This team won the basketball tournament this year. These pupils worked with our Premier Sports coach to train how to record our whole school Golden Miles'. Each week we will record the class results with the aim of increasing our physical activity. We utilise PE Premium funding to support this activity. We take part in OWL Trust competitons and tournaments as part of our drive to increase sporting activity with other schools. This dodgeball team came second recently at Throckley Primary.